The knee is the largest and most complex joint in the body. The knee is a synovial (fluid filled) joint capable of flexion and extension. 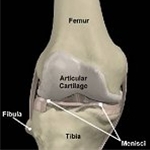 The knee joint also possesses a rotational component throughout the range of motion. The knee joint (Fig.1) is formed by the junction of the femur and the tibia. The patella, (Fig.2) knee cap, which sits anterior to this meeting, provides protection to the joint. The fibula provides an attachment site for one of the four ligaments that help support the knee. 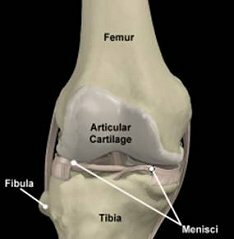 The knee has two types of cartilage. The articular cartilage (Fig. 1) is a slick shiny surface covering the end of each bone. Articular cartilage provides a smooth surface allowing easier joint movement. The menisci (Fig. 1) are two in number (medial and lateral). Menisci act as cushions between the tibia and femur and also important in stabilizing the knee. Ligaments connect bone to bone. The knee has four ligaments that connect the femur, tibia and fibula (Fig.3). 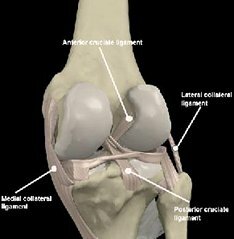 These ligaments are an integral part in providing the necessary stability the knee requires. The collateral ligaments maintain the side to side motions while the cruciate ligaments control the anterior and posterior movement. Damage to the ligaments is very detrimental to the functioning of the knee. Damage to either of the cruciate ligaments typically results in a very unstable knee. Tendons connect muscles to bones. 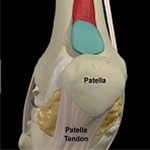 The patella tendon (Fig.2) is a tough band that originates at the quadriceps, envelopes the patella and connects to the tibia. It is one of the major extensors of the knee. 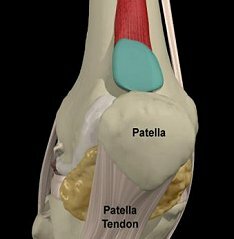 A portion of the patella tendon is often used surgically to replace a torn anterior cruciate ligament. The quadriceps muscles (Fig.4) are the primary extensors of the knee. 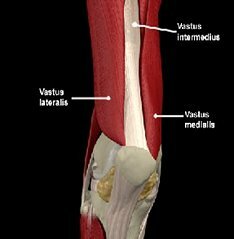 The quadriceps is comprised of the Vastus medialis, Vastus lateralis, rectus femoris (not shown) and the Vastus intermedius. The quadriceps originates at the hip and attach at the tibia in the front of the knee. The quadriceps muscles are susceptible to rapid atrophy from an array of different injuries. Rehabilitation of this muscle group is required to restore proper knee function. 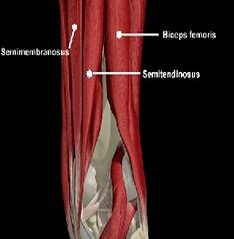 The hamstring group of muscles (Fig.5) are the main flexors of the knee. Originating from the Ischial tuberosity they attach to both the tibia and fibula behind the knee. The hamstring are often strained or torn during running or sprinting activities. Patellofemoral Pain, often called Runner's Knee, is common knee injury. Shop our selection of knee braces and supports for runner's knee. Read more..
View our recommended knee braces for meniscus injuries. Prevent meniscus tears or provide support for your torn meniscus with a knee brace. Read more.. 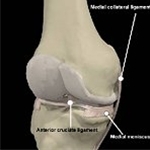 The MCL injury is a common knee ligament injury. Shop our selection of knee braces and supports for MCL injuries. Read more..
Shop our selection of knee braces, sleeves, and therapy products for Osteoarthritis of the Knee. Read more..
Buy Direct from US Manufacturer The Innovative All-in-One Pneumatic Knee Splint Simplified Cryotherapy Variable compression knee splint with fixed air bag and removable ezy-gel cold therap Read more..